• Legally certified as explosion-proof and dust ignition-proof. • Utilized for the recovery of metallic, conductive and explosive dusts, into a liquid immersion bath such as water, paraffin oil or mineral oil. Renders hazardous dusts inert. • Recovery capacity of 22 lbs (10 kg) of dust into 7.9 gallons (30 liters) of neutralizing liquid. • Includes HEPA H14 Filter with 99.995% efficiency on0.3 micron. Filter is located downstream of the motor. • Stainless steel recovery tank (SAE 304). Easy “one click” detaching and connecting of tank! • Unit is static-dissipating (kit included) and conductive. • Aerosol leak tested for quality assurance. • Equipped with easy-glide cart and tool basket. • Dynabrade recommends the use of Mineral Oil with viscosity of 10.5 cSt. 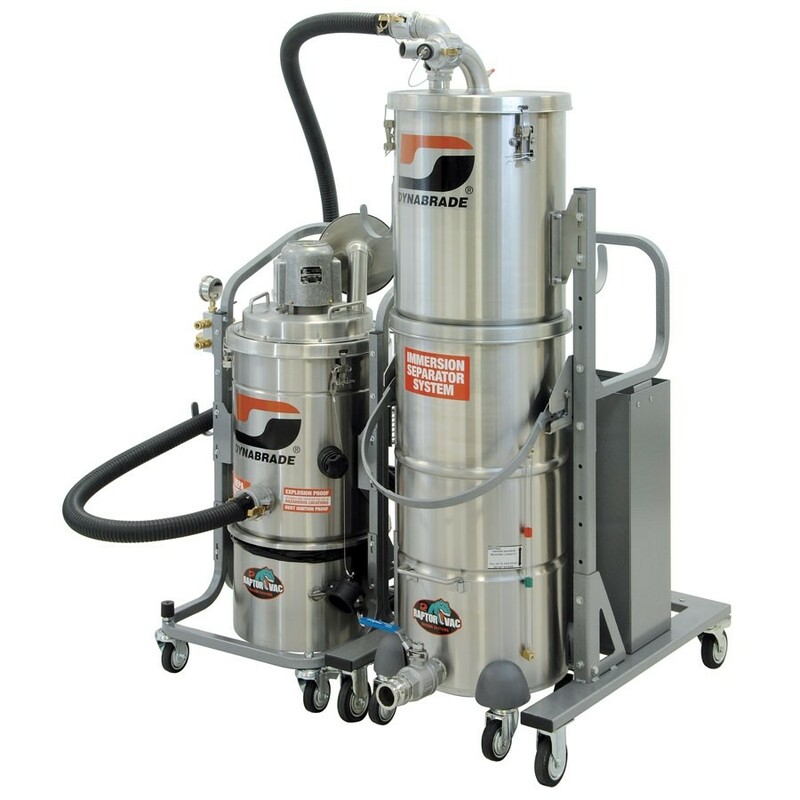 The Dynabrade 61462 Raptor Vac Division I, Top Level Electric Immersion Seperator aggressively captures workplace dust and debris to provide a productive and safe working environment. Dyanbrade Portable Vacuum Systems are designed to adhere to the new and exacting standards of EU Working Dust Regulations. Raptor vacuums are certificated for EU standards including M-class, ATEX, EX (explosive proof) Zone 21 and Zone 22. Production rates will also greatly improve, as any dust particles caught between the tool and the work surface will be extracted, allowing the grit of the abrasive to cut into the work quicker and more precisely. Dynabrade raptors can be powered electrically and pneumatically, the latter being ideal for carbon fibre dust. Conductive and non-conductive hoses can be used to discharge any static charge back to earth. For an in-depth guide to dust extraction including metal dust extraction and explosive dusts please read more. Please complete the form below to arrange a tool demonstration for the Dynabrade 61462 Raptor Vac Division I, Top Level Electric Immersion Seperator or any of the Dynabrade range of tooling. Alternatively please call us on 01273 468736.